Illuminate your skin with this ultra-gentle, 4-in-1 gel facial peel that has exfoliating, clarifying, hydrating, and balancing effects. Enhanced by carob and brown seaweed extracts and lime essential oil, this botanical feast is a natural astringent that tightens pores and firms the skin. It is an essential weekly treatment to give dry or sensitive skin a healthy glow and is especially recommended for those with visible redness. Exfoliates to leave sensitive skin soft and hydrated. Your complexion is glowing with health. I absolutely love this product! It removes dead cells and leaves your skin feeling so very soft. It smells wonderful too! A "must" for great looking skin! Use after cleansing and toning. 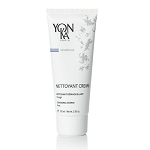 Apply in a thick layer over face, eyelids and neck. Let the skin recondition itself for 5 minutes. Next, eliminate the peels with fingertips. Ideal for sensitive, normal to dry skin.